Struggling to hit consistently accurate shots? Start at the beginning. If, when you are in your downswing, you can swing on plane with a good swing path (the club coming to the ball from inside the line), then the game of golf gets a lot easier. It gets easier because: you’ll be a lot more consistent, you’ll be a lot more accurate and you’ll hit the golf ball a lot further. You must want at least one of those benefits. But, swinging on plane with a good posture isn’t really possible if you haven’t got a good setup and posture at address. Good golfers who are having a bad ball-striking day can often trace their problem back to setup and posture. Make sure you are set up to play your best golf. 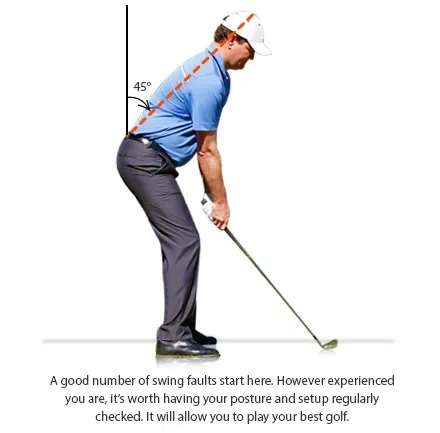 Even better players should think about a regular check-up on their setup and posture. If you start from a good setup and posture it is much, much easier to make the correct upper body turn on the backswing. Assuming your body allows it, can you feel your upper body rotating around your spine on the backswing. Can you feel your left shoulder (right-handers) rotating under your chin. As you get to the top of your backswing, have your shoulders stayed in line, can you feel where your right shoulder is (again on right handers). Too many golfers ‘pick up’ the club with their hands and arms with the upper body ‘sort of’ following along. They’ve seen all the pictures of where the club should be positioned at the top and they’ll contrive to get their club in that position. Poor rotation means the first move back on the downswing is almost certainly going to be fatal to any chance of the swing being on plane with the clubhead coming at the ball from the inside. Let us show you how to rotate your body on the backswing. Do that right and the next move is so much easier. 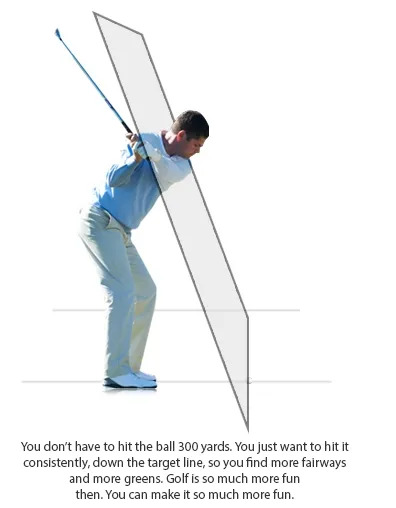 You all want to have a downswing that is on plane, with the clubhead coming at the ball from inside the line.You know golf gets so much easier. You hit it more consistently, more accurately, and you hit it longer. We are much more likely to get you to this point if we have made sure your setup and posture allows your upper body to rotate correctly on the backswing. From the correct position at the top of your backswing (and the physical limitations you may have will determine where that is), it is much, much easier to start the downswing correctly on plane. If your setup and posture is flawed, it may well limit your rotation on the backswing, stopping you from getting into the right position. 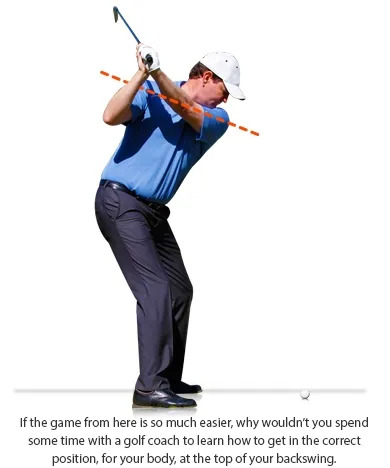 If you swing back with your arms and no rotation, then you won’t find the right position at the top of the backswing and you surely won’t have power. And from the wrong position it is so much easier to get outside the line right from the start. Don’t do that to yourself. Remember, your golf is our business. We are passionate about helping you on your Journey to Better golf. If you would like to improve your game from the tee, contact us and set up a lesson or book in for one of our improvement programmes.